The kind folks at Negri Electronics recently sent us a European Galaxy Note II. I unboxed it yesterday. Sure, it’s not the model that will launch here in the United States, but it’s nearly identical. It’s already my favorite smartphone ever and, believe it or not, even though the screen is bigger than the original Note, the device doesn’t feel nearly as bulky. 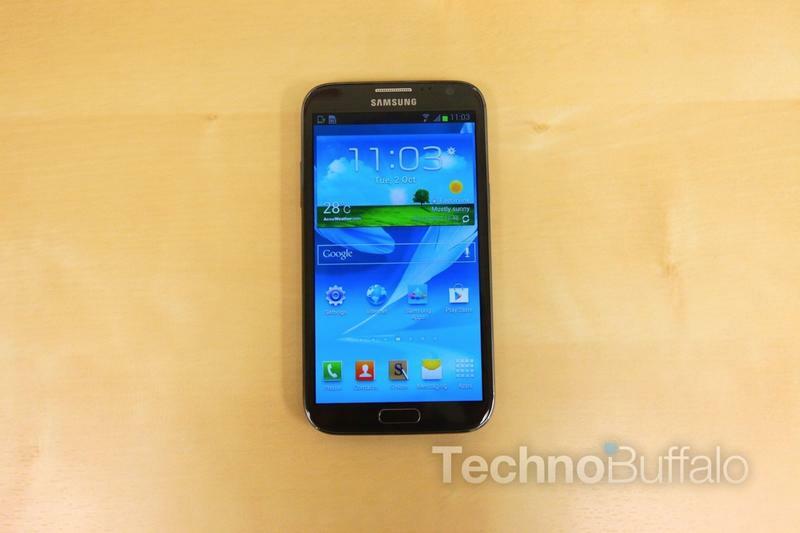 In fact, it’s like a larger Galaxy S III with better hardware. It’s going to launch on every major U.S. carrier here in the United States, and it has already secured its place as my favorite smartphone ever. You know when you’re down to the last bite of a cheeseburger and it’s just the most deliciously satisfying bite ever? That’s kind of how I feel about the Galaxy S III and the Note II. The Galaxy S III is my delicious cheeseburger and the Galaxy Note II is the final bite that satiates my hunger pains. You know that point in the restaurant when you want to show everyone the latest YouTube video but instead of showing it to everyone at once you have to pass it round and round again? That problem is dead in the water with the Galaxy Note II. It’s like having a movie theater in your pocket. I called a few of our writers in to my office this morning and booted up one of our unboxing videos and everyone was easily able to see the clip. The colors on Samsung’s HD Super AMOLED displays may not be as accurate as those on the iPhone 5, but they certainly pop off of the screen and really donate to the vivacious multimedia experience. The Galaxy Note II runs the latest and greatest version of Android, Jelly Bean, and it’s amazing. As we’ve reported in the past, everything is super quick and “buttery” smooth. The Note II’s quad-core processor seems to take everything I throw at it in stride. Plus, Android 4.1 includes Google’s brand new Search engine, which is on a par with, if not better than, Apple’s Siri voice engine. 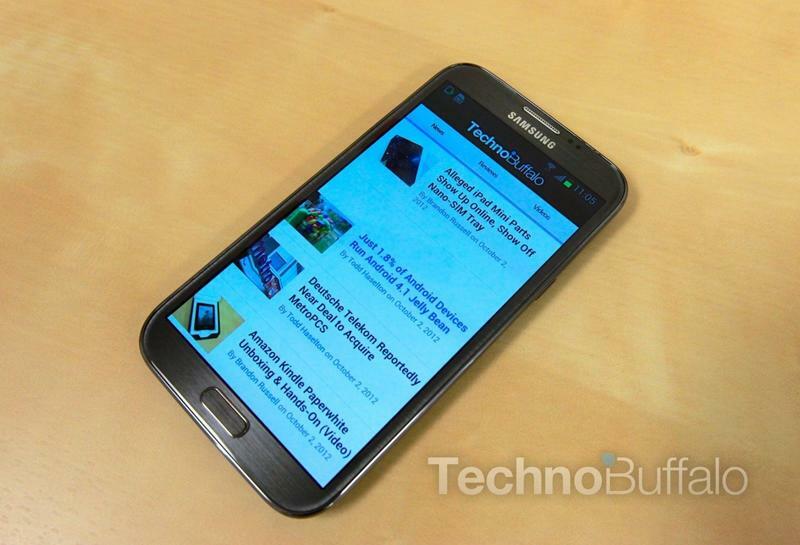 Samsung’s TouchWiz is still loaded on the Note II, but I like a lot of what it has to offer. Saved video clips, for example, are active and live. The thumbnails jump around showing you other parts of the clip. Like the Galaxy S III, there’s also an option to pop-out the video and have it playing on the homescreen wherever you want. You can resize the video by pinching and zooming it and, since the screen is so large, it’s easy to surf the web or fire off an email while a clip is playing. Samsung’s S Beam software is also pre-loaded on the Note II and it makes it fast and easy to send large files between two devices. I quickly transferred over a ton of photos from my gallery in just a few minutes, for example, but you can use it to send videos, too. Oh, the keyboard is much better than ever before, too. I was able to immediately type without errors, but that’s also likely because there’s plenty of screen real estate. The Galaxy Note II features a 1.6GHz quad-core Exynos processor, which we’ve found to be a good deal faster than the Galaxy S III processor after a few preliminary tests. 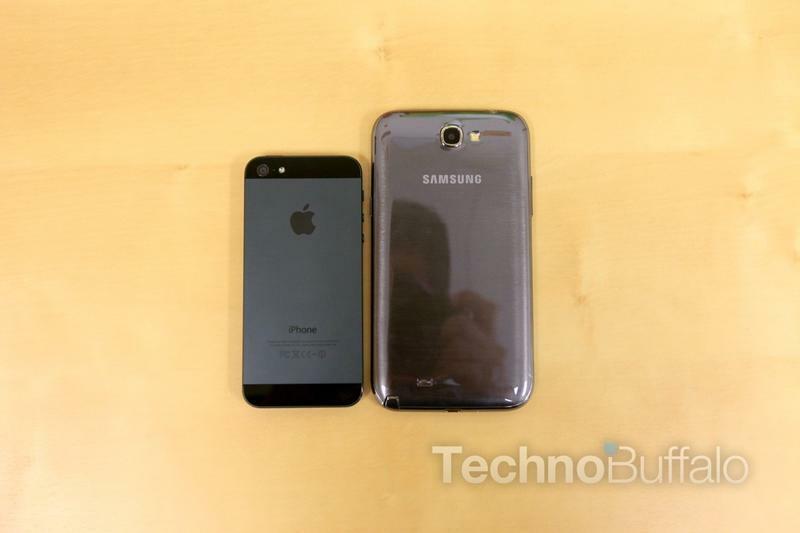 The Galaxy S III received a score of 3352,while the Galaxy Note II had a crazy high score of 5,805. 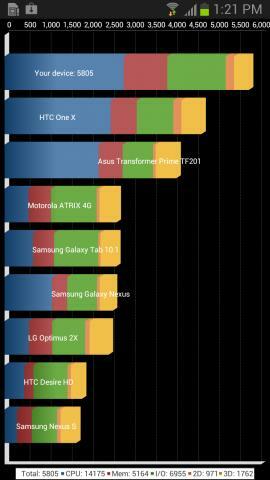 That’s a huge difference, and a higher than the quad-core NVIDIA Tegra 3-packing HTC One X and ASUS Transformer Prime TF201. 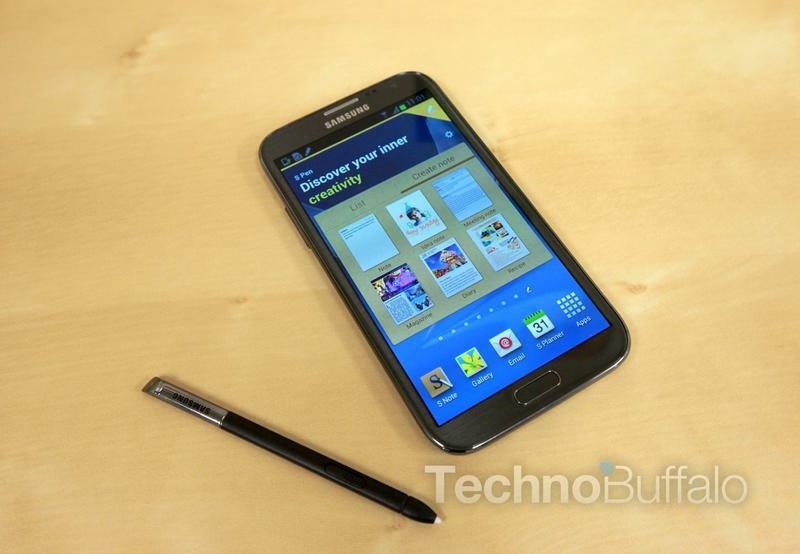 Samsung’s Galaxy Note II stylus, and the software that powers it, are both improved. The stylus itself is longer and fatter than the one included with the original Note, which makes it much easier to hold. 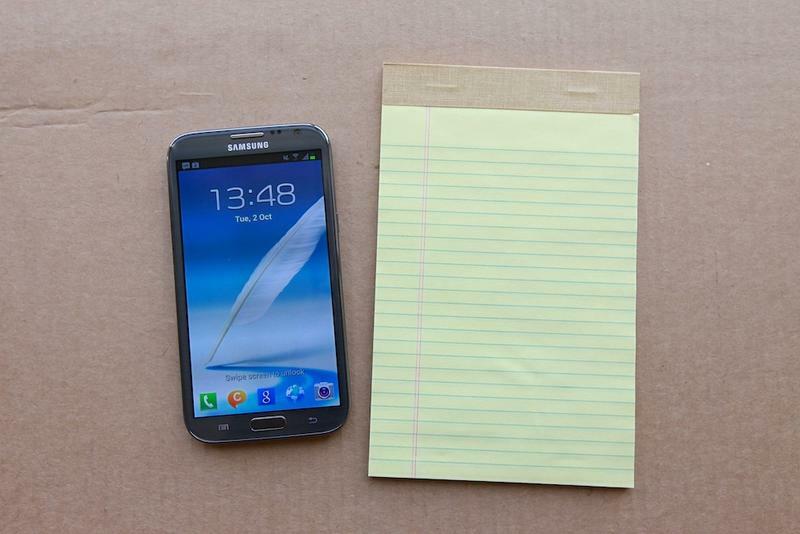 There are also several software enhancements, like the ability to hover a mouse over the screen to select specific elements, a small notification that alerts you when the S Pen has been removed the ability to quickly launch “quick note” software once the pen is taken out of its socket, and a battery saver option that automatically prevents the screen from searching for the pen when it’s not in use. There’s even an alert if you have the S Pen out for too long and the phone thinks you might have misplaced it. That’s great, especially for people like me who like to take notes while eating and may pick up and leave without realizing I’ve left the pen on the table. I’ll reserve my absolute final thoughts until our mobile department reviews the device fully, but I can already say that this is my favorite smartphone ever. Samsung packed a ton of power, a stunning display and excellent software into a smartphone that, while big, is the most brilliant I’ve ever used.